The Town of Bamberg is listed as a World Heritage Site primarily because of its authentic medieval appearance. From the 10th century onwards, its town layout and architecture has been a great influence in Central Europe. Klein-Venedig ("Little Venice"), a colony of picturesque fishermen's houses from the 19th century along one side of the river Regnitz. Michaelsberg Abbey, built in the 12th century on one of Bamberg's "Seven Hills"
I'm afraid I will not second the raving reviews below. However I might just have caught Bamberg on a bad day: there were streams of tourists milling around (some of them even aboard pseudo-Venetian gondolas), a number of stag/hen parties, some drunks occupying park benches, a couple of homeless. I even encountered a loud group of whom one person used the Nazi salute. There's a jail sentence for that in Germany. The city itself reminded me a lot of Strasbourg - its riverside location, typical German construction style and the cathedral. But of course there are some worthwhile things to see. The former City Hall is the most prominent of these. It has splendid frescoes on the outside. I also liked the courtyard of the Old Palace. It is easy to explore Bamberg by foot and, if you start at the train station and head towards the cathedral, you will pass through each of the different sections. The main sights are up on the hill and on the island at its foot. Make sure you don’t miss the Bamberg Cathedral the Old Town Hall, the Neue Residenz and its gardens, and Michaelsberg Abbey. Bamberg is also a wonderful town to wander around and the architecture in the older parts is beautiful. From the river, you’ll be able to ‘Little Venice’, which is a collection of fishermen’s houses from the 19th century. Another particularly famous aspect of Bamberg is the beer. It has a rather unique style of brewing that leaves some of the beers with a smoky or bacon flavour. The small pubs in the area at the base of the cathedral hill will happily serve you a glass – and it’s a good way to finish up a visit to this wonderful little town. Inscribed on the UNESCO list due to its Slavic connections, its architecture and its links with the 18th century Enlightenment, Bamberg is known among beer lovers for its sheer variety of brews in that beeriest of countries, Germany. I have been twice with friends: in August 2010 and May 2015. The town is built around two rivers. The medieval and baroque town houses and buildings are well preserved and most of the streets remain cobbled. Of all the buildings, the town hall, or Rathaus, is the most impressive to my mind. 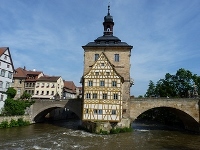 As for the Slavic connections, Bamberg played a role in the past a link between Central and Eastern Europe, which explains its rather Polish feel. In the 18th century Enlightenment it was home to the philosopher Georg Wilhelm Friedrich Hegel and the author E.T.A. Hoffmann – on whose work ballets including The Nutcracker and Coppélia were based. Although a pleasant town, if you are not a real beer afficionado seeking to check out the offerings of each of its 11 breweries, Bamberg is quite doable in one night. After narrowly missing the hourly train to Würzburg, we passed the time drinking local lagers and playing list-based drinking games … a finer activity on a summer’s day I haven’t yet found. I visited Bamberg in June 2013. I was very lucky with the weather which was sunny contrary to what had been forecasted till the day before. Perhaps this was one of the reasons why there weren't huge crowds of tourists, who knows? I did not complain and explored all the sites the city has to offer and enjoyed walking through the narrow winding alleys and found a couple of welcoming and quaint beer gardens in the process. The Rathaus is an incredible sight, seeing is believing as they say. It appears to be almost floating in the middle of the river and is adorned with colourful murals on its sides. To me, Bamberg is one of the top WHS Germany has to offer and definitely well worth a visit! Bamberg is a very historic and quite pleasant town in northern Bavaria, just a short train ride from Nuremberg. It features several interesting buildings, above all the old town hall (on an island in the river) and the famous cathedral with the equally famous Bamberg Horseman. The town is easily explored on foot, and was very nice to discover on a warm fall day. The cathedral museum should not be missed. Central Europe has thrown up some of my favourite towns and Bamberg certainly ranks among them. We spent an unexpected and very cold day here in January 2007, and it was a great experience. The centre of the town, situated between two rivers, is very nice with lots of cobbled streets and squares. However it is once you get to the river and see the fantastic and unique Altes Rathaus (picture) built between two bridges over the river, that the town becomes really charming. The murals on the side of the building are great, reminding me of many of the buildings in Cesky Krumlov. This side of the river is actually fairly steep with lots of twisty lanes hiding café’s and antiques shops. 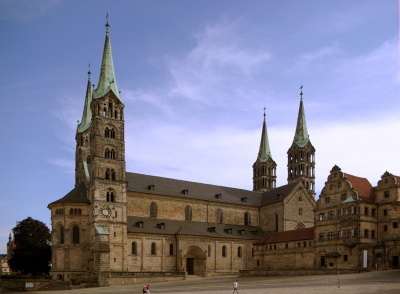 It all leads up to Domplatz, which as the name suggests houses the Cathedral and its surroundings. The Cathedral itself is a bit Gothic/ Romanesque hodgepodge but worth a peek. The other sides of the square are taken up by; the impressive Neus Rezidence with an apparently great rose garden and the Old Courthouse, which is worth having a peek into to see the lovely courtyard surrounded by large half-timbered buildings. It was cold and getting dark so unfortunately we didn't manage to make it up to Michaelsberg, to see the monastery, perhaps a reason to return! Bamberg is a town famous for its beers, and there are plenty of places to try the local brews. We enjoyed trying all the varieties at Ambräusianum at Dominikanstr. 10 but there are plenty great looking pubs. If you only get chance for one beer then try the brew that Bamberg is most famous for Rauchbier (Smoked Beer) it is a very distinctive flavour, a little like drinking a bonfire/ bacon, much more enjoyable than it sounds! I really enjoyed Bamberg and would thoroughly recommend a visit, the trademark Altes Rathaus and Rauchbier really shouldn’t disappoint in one of Central Europe’s nicest towns. One of our favorite towns is Bamberg, a beautiful cathedral city that has escaped extensive war damage. On top of the hill four sharp spires rise from the Transitional Gothic cathedral. A wood sculpture in the cathedral, the monument for the tomb of Emperor Henry II, took the famous sculptor, Tilman Riemenschneider, 14 years to carve. 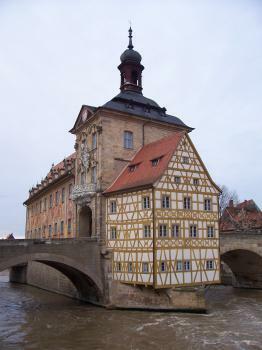 Das Bamberger Brücken-Rathaus, or Bamberg’s City Hall sits on a bridge over the River Regnitz. This incredible building, sits on a small island, anchored in the middle of the river, with a little timbered building, Häuslein, that seems to have been just tacked onto the bridge’s pierhead. The two nights in two different years that we spent at the campsite in the suburban town named Bug, it rained and rained. What is remembered depends a lot on sunshine or rain. In either case what we see is exciting, but when we have another chance to see Bamberg, we will pray for sunshine. Equestrian Statues: The Cathedral contains "The Bamberg Horseman" from the early 13th Century. It is considered the earliest monumental equestrian statue in Europe since Classical antiquity. It is also one of the earliest to depict Horseshoes. Breweries: AB evaluation: "Bamberg's .. economic basis continued to be trade, particularly in hops." "The architecture here encompassed everything from buildings for the trades, breweries, town houses and even palatial edifices." ... "One example of an old brewery inside the inscribed area is the Schenkerla tavern in the city centre on Dominkanerstrasse. .... Heller has been brewing since 1678. The brewery was orginally based in the tavern but moved in 1936". Also "The Benedictine monastery of St Michael looms above the city. It once had its own monastic brewery which is now a brewing museum". Artificial Islands: The Old Town Hall "island" was created first as a bridge with a gate tower and then later was extended to allow the building of the Town hall on either side. 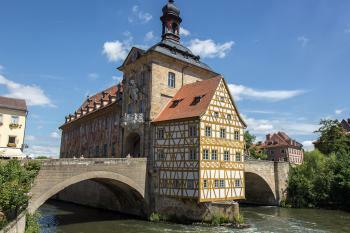 Cultural sites taking up an entire island: The Centre of Bamberg occupies an entire island between 2 branches of the river Regnitz. Furthermore - the Town Hall is situated on and occupies an ENTIRE different island ON ITS OWN! Dubbed as another WHS: The once fisherman's settlement dating from the Middle Age and lining the shore of the Regnitz River is known as the "Little Venice"
233 Community Members have visited.